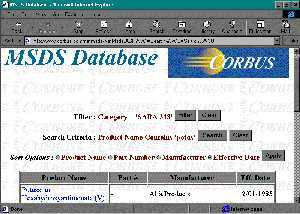 Corbusvides enterprise-wide search, view and print functionality for MSDSs (html, sgml, text and images) through a web browser. Search using product name, product CAS #, synonyms, part #, ingredient name, ingredient CAS # or manufacturer. It enables the user to sort MSDSs by product name, part #, manufacturer or effective date, set filters for site, location, manufacturer, category, and active or archived MSDS. No installation is required on the client PC. The system is designed to reduce network traffic and speed up data access. It is designed to support multiple users, corporate, division or site-wide. The program adds intranet/internet support for the TERMS and MSDS Standard software programs.